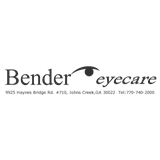 Bender Eyecare (Johns Creek) - Book Appointment Online! From helping you to select the perfect eyewear, to providing eyecare in an emergency, Bender eyecare will help you see your best and look your best. At Bender eyecare we pride ourselves in providing comprehensive eyecare Whether you need diagnosis and treatment of ocular disease, are interested in the latest innovations in the rapidly changing area of contact lens technologies, or simply want eyeglasses or sunglasses that give you a great new "look". If you are interested in regular eye exams, contact lens exams, emergency eye exams, or pediatric eye exams, Dr. Bender will provide attentive, compassionate and professional care that will exceed your expectations. As always, my visit with Dr. Bender was quick and easy. She is so easygoing and sweet and never tries to force products on you at all. Best of all, you don't have to do the old fashioned, irritating eye puff test here!